Wacker Chemie AG (Munich, Germany; www.wacker.com) has opened a new laboratory for food applications in Shanghai. This specialized laboratory will enable Wacker to provide its customers in Asia with even better support in developing innovative, customized products in the fast-growing food market. The focus is on food ingredients, for example for egg-free baked goods, whipped toppings or functional beverages; on dietary supplement ingredients, such as highly bioavailable curcumin; and on chewing-gum applications, for instance moldable sugar-free gum. Wacker Biosolutions is the life sciences and biotechnology division within the Wacker Group, which, in terms of nutrition, mainly focuses on ingredients for food and dietary supplements. In order to optimally support its customers in different regions around the world, Wacker already operates three specialized food laboratories in Burghausen, Germany, Adrian, Mich., and Singapore. Cyclodextrins are ring-shaped sugar molecules, which Wacker bioengineers from plant-based raw materials such as corn or potato. 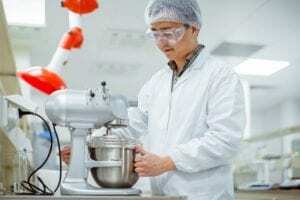 They have different functionalities to be used in different food applications, such as dairy, bakery, desserts and sauces to make them free from animal-based emulsifiers, cholesterol or solid fats. What is more, cyclodextrins protect sensitive ingredients such as vitamins and coenzymes from harmful influences, for example oxygen or light, and they increase the bioavailability of hydrophobic substances like the natural antioxidant curcumin. Additionally, the sugar rings can mask the bitter taste of health-promoting substances such as green tea extract. Wacker’s fermentation-based cysteine can serve as a vegan and halal-certified raw material for savory flavors and as a processing auxiliary in baked goods. Wacker’s solid resins polyvinyl acetate make it possible to produce top-grade chewing-gum. The Candy2Gum technology developed by Wacker enables to produce sugar free gum with depositing technology to make the chewing gum in different shapes. Moreover, Wacker experts have developed the world’s first 3-D-printing gum technology. The 3-D printer that is available in the new food laboratory in Shanghai can be used to produce tailor made gum in specially designed color, shape and flavor. This opens up entirely new possibilities for the confectionery industry.